FMIS Project Management Working Group (FMWG) from IT Department has sustainably been providing more capacity building activities and solving challenging issues for officers as FMIS users at four provincial treasuries, namely Kompong Speu, Kep, Kompong Cham, and Kandal provincial treasury. Besides capacity building activities, leaders and specialists from ITD have been participating in different manners of meeting with stakeholders to coordinating problems raised by the stakeholders regarding FMIS to push forward the implementation of the system. In the midst of June, ITD’s technical team set up reports and data interface integration between FMIS and ASYCUDA at Canadia Bank. Additionally, the working group has been studying and developing other report formats which are dire needs of General Departments and Departments implementing the system. Another FMIS’ feature, Electronic Fund Transfer (EFT) was installed on National bank of Cambodia’s system as a test before its official launch in the future. Moreover, ITD’s Change Management team has continued coordinating the impact of changes on stakeholders by improving the communication between the FMWG and the stakeholders in various mediums, specifically updating the development of the systems through face-to-face meeting, website, newsletter, news bulletin, as well as social networks. 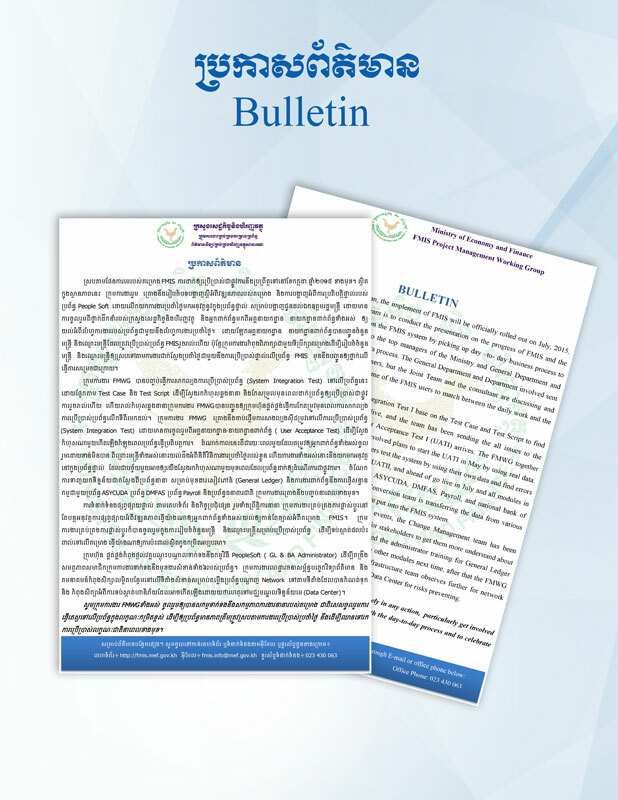 At the same time, the group has been preparing the activities timeline and related document, regarding which raising awareness activities to Line Ministries shall follow. The raising awareness activity will be a very crucial chance for FMWG to collect the inputs from line ministries in order to plan ahead the strategic plan and activities for the upcoming second phase FMIS roll-out at the line ministries. The Training team also kept working on solving the problems raised by officers and giving more training to elaborate the knowledge of end-users as an actual need. For instance, at the end of June, the team has trained 25 officers from GDB’s FAD about the use of FMIS. In order to ensure the betterment and effectiveness of Phase II implementation, the FMWG also continued improving its own capacity in term of knowledge and planning. As an example, Information Technology Infrastructure and Telecommunication team was equipped with additional training and monitoring on the system performance to secure the daily activities and security. In this stage of FMIS implementation, FMWG calls for, as well as, encourages the key stakeholders to continue supporting the FMIS with strong commitment and activeness. The working group will continue providing coordination in timely manner to solve all problems interfering the implementation of FMIS.